On November 6, GS Yuasa and the University of Tokyo unveiled a system that ascertains the "mood" of a room by monitoring a variety of factors -- including the feelings and behavior of the people in the room -- and relays the mood data to remote terminals where it is expressed as colored LED light. The system, called SHOJI (Symbiotic Hosting Online Jog Instrument), is similar in concept to KOTOHANA (developed by NEC and SGI), which are pairs of flower-shaped terminals that share data and change color according to emotion detected in voice patterns. Like KOTOHANA, the SHOJI system consists of a pair of terminals placed at separate locations. Each terminal is equipped with a full-color LED array, a microphone and five sensors (developed at the University of Tokyo) that detect light, temperature, humidity, infrared radiation and ultrasonic waves. In addition to constantly measuring the room�s environmental conditions, SHOJI terminals can detect the presence and movement of people, body temperature, and the nature of the activity in the room. Each SHOJI terminal constantly sends the room's mood data over the Internet to the other terminal, where it is expressed as colored light on the LED array. 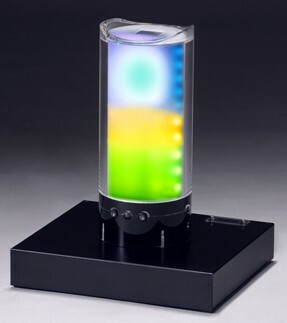 By checking the color of light on the SHOJI terminal, users can easily understand the mood in the other room. SHOJI's display consists of 10 rows of LEDs that emit colors corresponding to different emotions -- red for anger, blue for sadness, yellow for happiness, and green for peace. The display also provides a clear indication of mood shifts, with the top 5 rows representing the current mood of the room and the bottom 5 representing the recent past. GS Yuasa will soon put SHOJI to a series of field tests at Tokyo-area companies, allowing head office managers to keep tabs on the mood at branch offices (and vice-versa). Tests are also planned at hospitals and in residential settings. With the product release scheduled for April 2007, GS Yuasa plans to market SHOJI to companies at a price of between 300,000 to 400,000 yen ($2,500 to $3,300). Very interesting. Is this another way that we can be spied upon by Big Brother? Of course, it could also be helpful to managers to determine if the moral in their offices are conducive to optimum performance and alert them to any bad moods that may affect the entire spirit of the office. This sounds like an expensive version of the mood ring. auto-assembly » Blog Archive » Data Protection for Our Chemical Signals? Objets communicants » Blog Archive » Une chambre intelligente et� sensible!